This dish came together from a quick perusal of my fridge and a growl in my stomach. 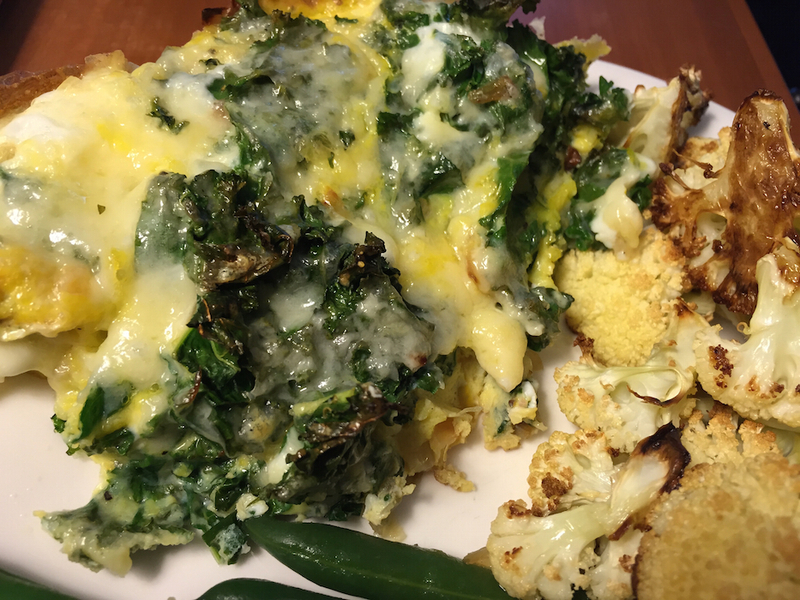 I started pulling out veggies that needed to be used up, and whipped up this delicious frittata. I think the real key with this is to get good caramelized color on your vegetables and to balance the crunchy vegetables with a creamy cheese. Other than that, I’m pretty sure you can get by with whatever vegetables and/or cheese you have on hand. In a medium, oven-proof pan, heat olive oil over medium heat. Add the shallot to the pan and cook until just beginning to soften. Add garlic and bell pepper, sauté until just beginning to brown. Add the kale and stir until the kale is bright green. Season the eggs with salt and pepper, then pour over the veggies. Stir a bit to make sure the vegetables are surrounded by the eggs. Once the eggs have set around the edges, top with cheese. Place pan in the oven about 8 inches from the broiler and broil on high for about 3-5 minutes, or until the eggs are set and just beginning to brown around the edges.